Puppet Master Blu-ray Review. One of the most zany and downright entertaining horror flicks of all time, David Schmoeller’s 1989 outing Puppet Master remains a firm fan favourite and has to date spawned no less than nine sequels of varying quality. One of the most zany and downright entertaining horror flicks of all time, David Schmoeller’s 1989 outing Puppet Master remains a firm fan favourite and has to date spawned no less than nine sequels of varying quality. The low budget cult flick concerns a group of living, mostly murderous puppets who come to life thanks to the arcane efforts of a hoary puppeteer named Andre Toulon. A group of occultists attempt to track down rumours that Toulon has indeed discovered the secret of life, though get more than they bargained for in the form of a series of bloodthirsty marionettes. A good time, at least for viewers, ensues. Psychics, Nazi spies, Egyptian spells, suicide, leeches and plenty of blood all add to the film’s distinctly (and often literally) visceral charms. Newly released on BD and DVD on local shores by Big Sky Video, this high-def edition features a 16:9 widescreen transfer, 5.1 surround sound and several worthwhile extras in the form of an audio commentary with producer Charles Band and presumably pseudonymous filmthreat.com founder Chris Gore, a Making Of featurette and no less than nine local and international Puppet Master trailers. Needless to say this is far and away the best this cult curio has ever looked or sounded, and an unimaginable improvement over the grainy full screen VHS and DVD editions which have flooded the market over the past two decades. 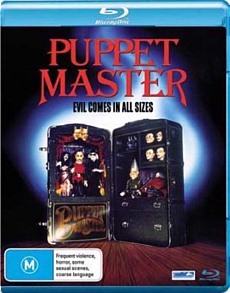 It’s not quite on a par with Full Moon’s 2010 20th anniversary special edition, which included the bonus feature Puppet Master: Axis of Evil and a slew of other goodies, but it’s worthwhile treatment for these pint-sized horrors and something of a treat for local collectors. Freaky 80s fun at its finest.